The drive to Kalona makes me laugh. It starts out directly enough: Take I-35 to I-80 and head east. Just before you get to Iowa City, you take the 230 exit and head south onto a road called Black Hawk, then turn onto Black Diamond Ave. Then you turn on the, um, Orval Yoder Turnpike. That’s when I start to giggle. Turnpike? Really? When I think of a turnpike, I think of New Jersey. And believe me, this ain’t New Jersey. This tiny, rural “turnpike” takes you to Frytown, at which point you connect with Hwy. 1 and head into Kalona. 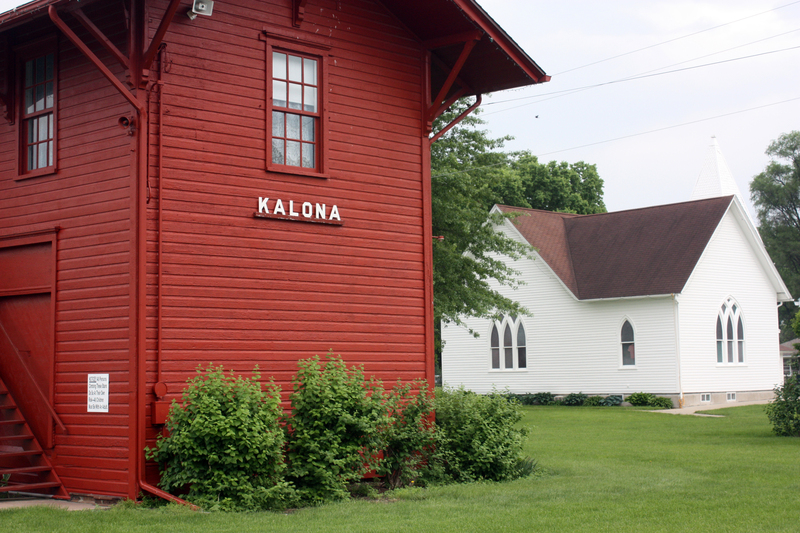 Washington County in general, and Kalona in particular, are well worth exploring. The county boasts a fine collection of barn quilts, and the area is home to a large population of Amish and Mennonites. Their influence can be seen along the country roads, in the countryside businesses, and even in town. When I arrived in Kalona early Saturday afternoon, my first order of business was to find a place to eat lunch. 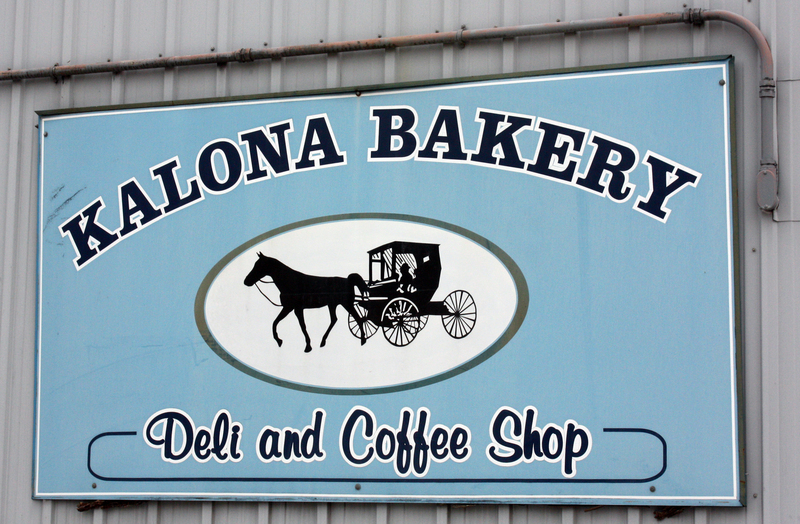 I found it at Kalona Bakery, a combination bakery/restaurant in downtown Kalona. The menu is small – mostly sandwiches and pre-packaged salads – but I ate my fill for a mere $5.85, including a piece of pie. 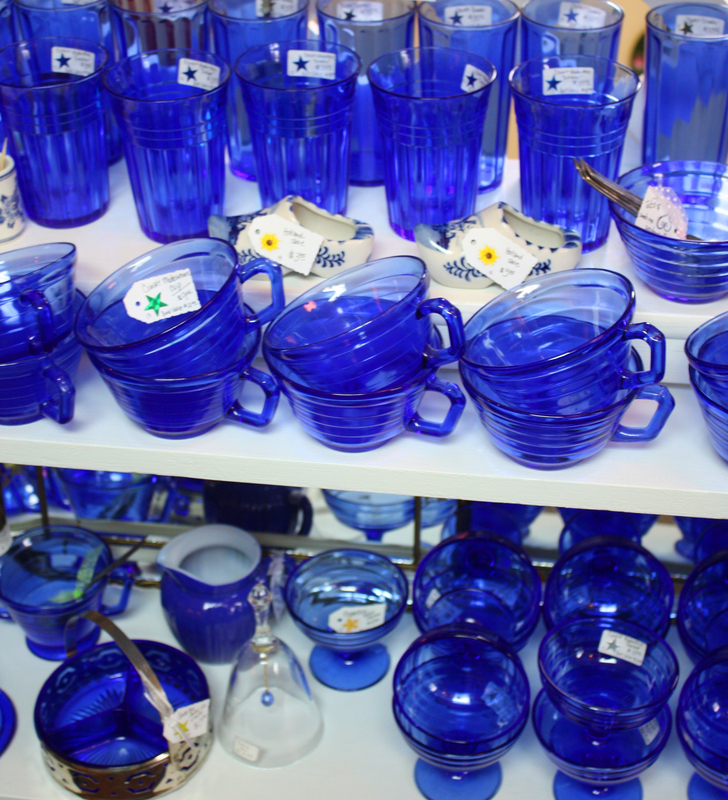 After lunch, I strolled through two of the town’s many antiques shops: the Pink Begonia and English River Antiques – both charming, clean, and filled with affordable, good-quality antiques. I also walked through the Kalona General Store, which has a little bit of everything, and the Village Shoppe – a great store for quilters. I hesitated to spend too much time shopping downtown, because I wanted to get to the Kalona Historical Village, and it closed at 4 o’clock. 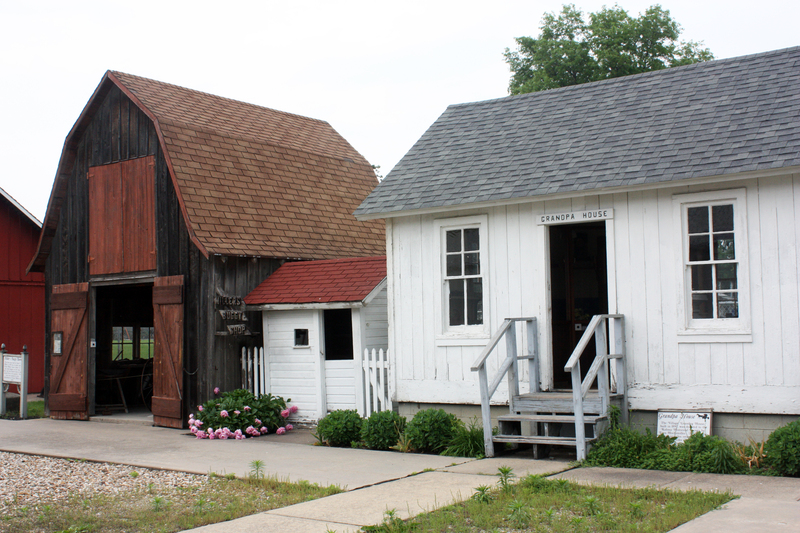 For an entry fee of $7, you can tour the well-preserved historical village as well as the Quilt and Textile Museum, which is located in the Kalona Historical Village Welcome Center. The fee gets you a guided tour of the village, and I was able to join a tour already in progress. The grandpa house was especially interesting: It was built in 1890 to provide retirement living for the Old Order Amish when the younger generation took over management of the farm. Our tour guide took us through the church, the house and its wash house, and through the Wahl Museum, which tells the story of life in early Kalona. The smaller buildings can be visited on your own. Each has a recorded description; you push a button and a mannequin “speaks.” I pushed the button in the first building, and the voice was way too creepy…so I just looked quietly around the rest of the buildings. Back inside the visitor center (where the air conditioning felt wonderful after being outside in 90-plus-degree heat and humidity), I toured the two rooms of the quilt museum. 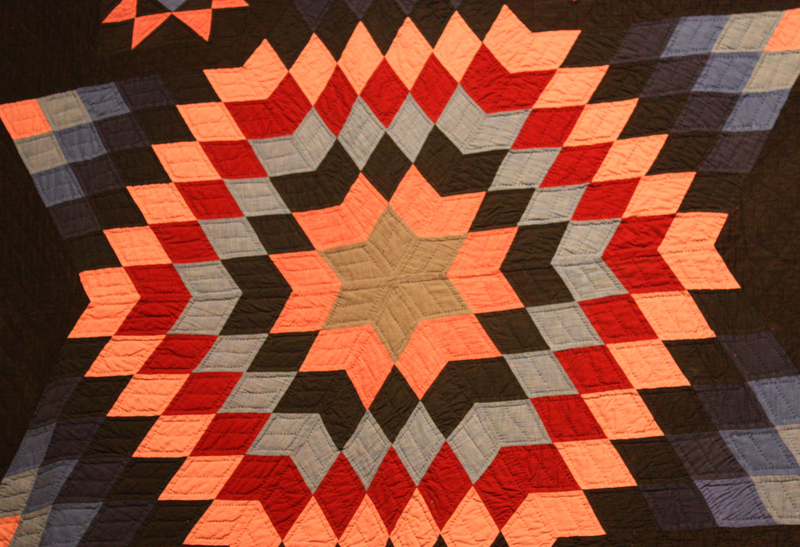 One room features the “English” quilts – that is, quilts made by non-Amish – and the other room features the Amish quilts. Both rooms feature a large collection of spool cabinets. By this time, the historical center was closing for the day, so I headed out of town. 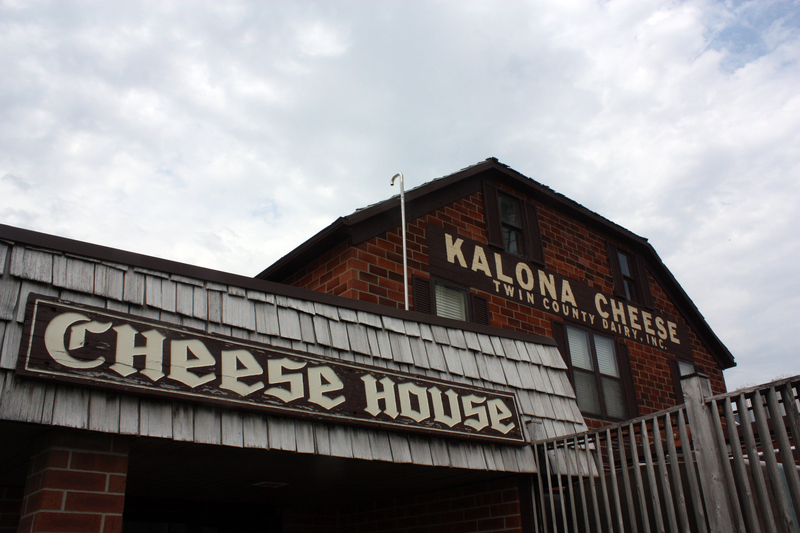 But first, two more stops: Stringtown Grocery and the Kalona Cheese Factory. 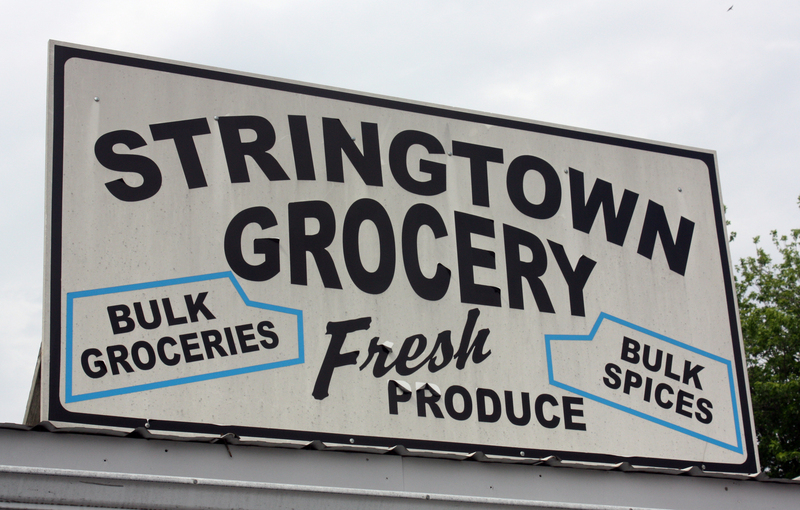 I had never heard of Stringtown Grocery, but when I saw a sign on the highway, I thought the name sounded intriguing. The store is run by Mennonites (or perhaps Amish — I find it hard to make the distinction when simply looking at how the individuals are dressed) and offers fresh baked goods, fresh produce, and an incredible array of bulk groceries and hard-to-find items. Some of the people shopping there appeared to be purchasing enough flour and oats to last through a coming apocalypse. (Perhaps they bake for a living?) It was indeed an eclectic mix of shoppers. One Amish man parked his horse-drawn carriage beside the store and loaded up on fresh vegetables and dairy items. A little girl in front of me was buying penny candy. 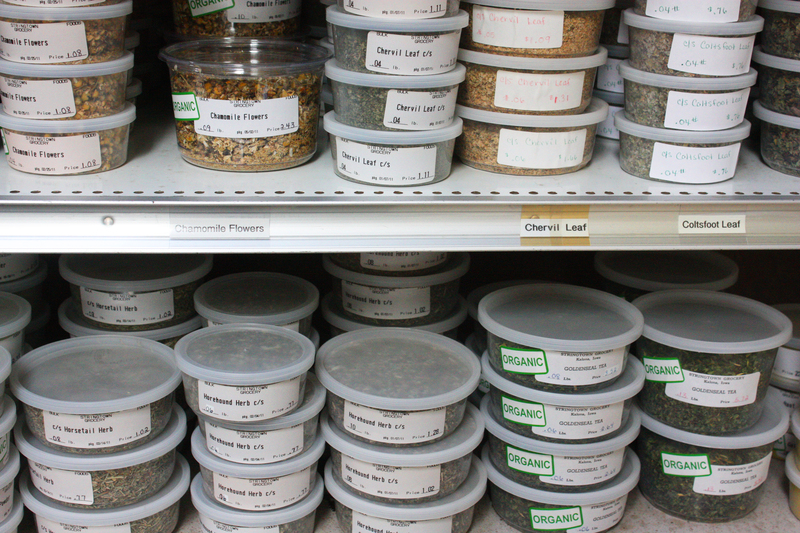 I was amazed at the variety of goods being offered in the tiny store: noodles and vegetable seeds and real vanilla extract; nuts and grains and baking supplies and dried fruits packaged into bags and plastic containers with hand-written labels; local cheese and butter; and spices galore – all priced very reasonably. I bought a cold drink, some smoked farmers cheese, and a bag of pistachios. My next stop was the cheese factory on the outskirts of town. There you can watch cheese being made and buy local and assorted cheeses in a small shop. I purchased a chunk of locally produced gouda. 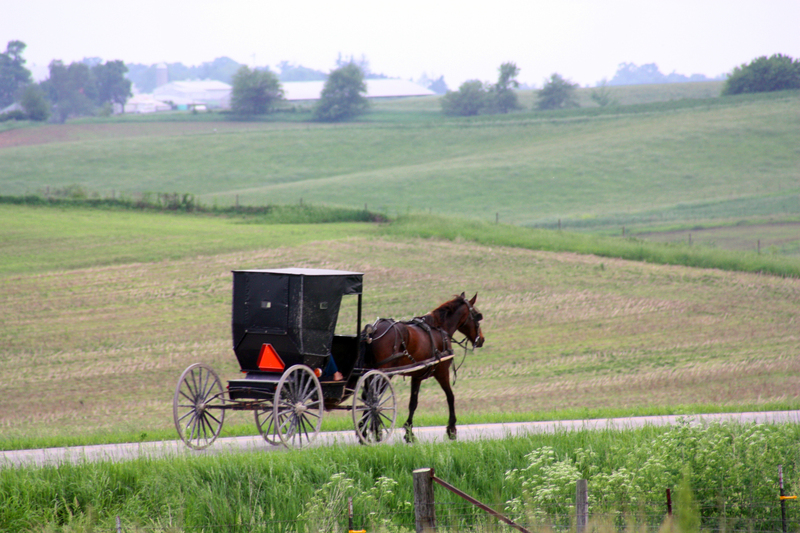 I saw a number of horse-drawn carriages during my visit to Kalona. Many of the local farms offer goods for sale. I saw signs for baked goods, fresh eggs, and garden supplies. You could easily spend the weekend just driving through the countryside. It’s a bit like stepping back in time — in a good way. 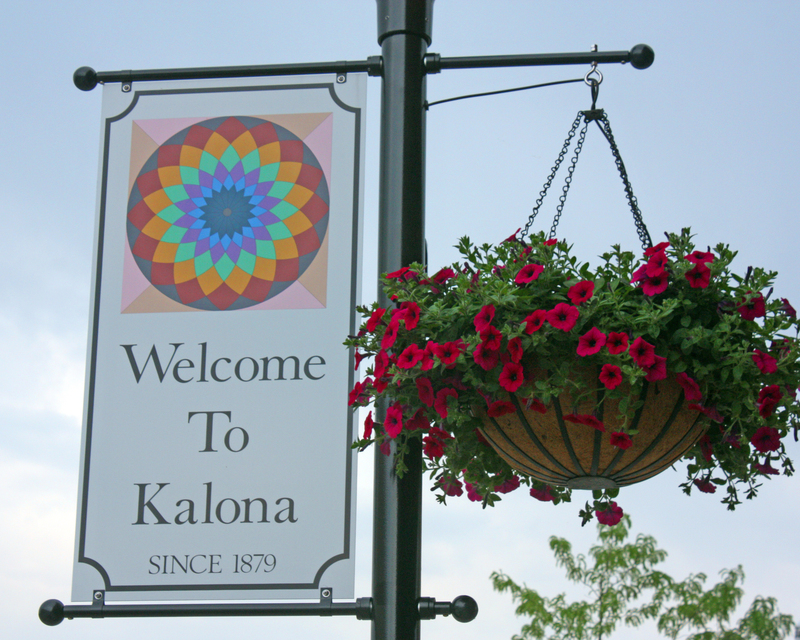 I absolutely LOVE Kalona! We were just there visiting my Grandparents. We also went to Stringtown, Pink Begonia, The Kalona Bakery and many other fun antique stores — Sisters, Bloom and the church turned antique store. 🙂 What a treat to go back in time, right??? It was so nice there in kalona it was my first time there i was there for the 2011 baberuth regionals 12u softball we got 5th in regionals it was the best week of my life the bakery was the best the dougnuts were fresh out of the oven . the cinnimon rolls were bigger then a bowl then right next stire was a mini mall the cheese factory was great big pickels for 80 cents every kind of cheese in the world the beef jerky was the best it such a nice place wish i could go back from kansas !!!! I love Kalona stores especially the grocery store that has reduced damaged goods ect. Hello, I enjoyed this post very much. I recently made a post about Kalona and linked back to this post, using one of your pictures. If this is unacceptable, please let me know. I don’t see a way to contact you other than via comment. As a native Kalona resident and someone who was raised Mennonite, I’ll help out with what seems to be a common confusion although I’m not sure where it originates. First off, Stringtown is run by Amish. You will find Amish dressed in plain-colored dresses all of the same style with bonnet-style head-coverings and strings, men with plain, usually dark clothes and suspenders. Mennonites don’t have a certain dress per se, just usually on the more modest side, although some of the older order or more conservative Mennonites do stick with skirts and dresses (usually on the plainer side) and head coverings (usually flat or doily-type; though, some older women wear small raised ones to church) and for Mennonite men it’s really hard to pick them out by dress, though the more conservative ones just dress a little plainer – usually khakis and button-down shirts or some nice jeans sometimes. I love visiting Kalona Iowa I learned alot about the amish culture from my ex husband who is originally from Kalona. Its very beautiful there especially during the fall. My ex husbands dad ran a bakery off their farm on highway one. Are these places open for business on Sundays? I don’t know for sure, but I’m guessing most are not.